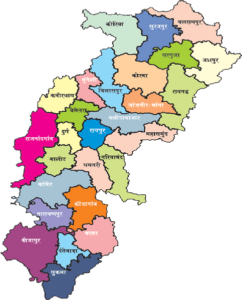 Chhattisgarh is a state in Central India and was formed on November 1, 2000 by partitioning 16 Chhattisgarhi-speaking southeastern districts of Madhya Pradesh. Chhattisgarh borders the states of Madhya Pradesh in the northwest, Maharashtra in the west, Andhra Pradesh in the south, Orissa in the east, Jharkhand in the northeast and Uttar Pradesh in the north. Raipur is the capital of Chhattisgarh, which is the 10th largest state in India, with an area of 135,190 km2 (52,200 sq mi). The northern and southern parts of the state are hilly, while the central part is a fertile plain. Deciduous forests of the Eastern Highlands Forests cover roughly 44 percent of the state.In the north lies the edge of the great Indo-Gangetic plain. The Rihand River, a tributary of the Ganges, drains this area. The eastern end of the Satpura Range and the western edge of the Chota Nagpur Plateau form an east-west belt of hills that divide the Mahanadi River basin from the Indo-Gangetic plain. The central part of the state lies in the fertile upper basin of the Mahanadi River and its tributaries. This area has extensive rice cultivation. The upper Mahanadi basin is separated from the upper Narmada basin to the west by the Maikal Hills (part of the Satpuras) and from the plains of Orissa to the east by ranges of hills. The southern part of the state lies on the Deccan plateau, in the watershed of the Godavari River and its tributary, the Indravati River. The Mahanadi is the chief river of the state. The other main rivers are Hasdo (a tributary of Mahanadi), Rihand, Indravati, Jonk, Arpa, and Shivnath. The climate of Chhattisgarh is tropical. It is hot and humid because of its proximity to the Tropic of Cancer and its dependence on the monsoons for rains. Summer in Chhattisgarh is from April to June and temperatures can reach 48°C (100°F). The monsoon season is from late June to October and is a welcome respite from the heat. Chhattisgarh receives an average of 1,292 millimetres (50.9 in) of rain. Winter is from November to January and it is a good time to visit Chhattisgarh. Winters are pleasant with low temperatures and less humidity. The temperature varies between 30 and 47°C (86 and 117°F) in summer and between 5 and 25°C (41 and 77°F) during winter. However, extremes in temperature can be observed with scales falling to less than 0°C to 49°C. Chhattisgarh has 27 administrative districts. Out of these two new districts (Bijapur and Naryanpur) were carved out on May 11, and 9 new districts on Jan 1, 2012. The new districts have been created by carving out from the existing districts to facilitate more targeted, focused, and closer administration. These districts have been named Sukma, Kondagaon, Balod, Bemetara, Baloda Bazar, Gariaband, Mungeli, Surajpur, and Balrampur. On the basis of regional topography Chhattisgarh region is divided into three agro-ecological regions, the Northern Hills, the Central Plains and the Bastar Plateau. 1.Northern Region:- The districts that are part of this region (Korea, Surguja, Jashpur, Raigarh, and Korba) have similar geographical, climatic, and cultural contexts and harbour dense forests, hills and water reservoirs. It is home to several indigenous tribal communities such as Paharikorba and Pando, etc. Governed largely by tribal customs, culture and traditions, in the rural areas of the region, people are dependent largely on agriculture and non-timber forest produce (NTFP). The level of migration from this region is comparatively limited. The urban centres are limited to Korba and Ambikapur. Korba is the largest town, and the limited industry is concentrated here. There are coalmines in Surguja and Korea districts. 2.Central Plains Region:- Raipur, Bilaspur, Janjgir-Champa, Kabirdham, Rajnandgaon, Durg, Dhamtari, and Mahasamund are the districts that fall in the central plains. Mahanadi is the primary source of water for irrigation and domestic use. Owing to the presence of large number of indigenous varieties of rice, the central plains of Chhattisgarh are known as the ‘rice bowl’ of Central India. Bhilai and Durg are well known urban areas, both with large steel plants. Rural craft is well developed in the region and well known (e.g. the silk weavers of Janjgir-Champa). The region is densely populated with Raipur and Durg account for almost half the total urban population of Chhattisgarh.